Here’s some good news from Apple. 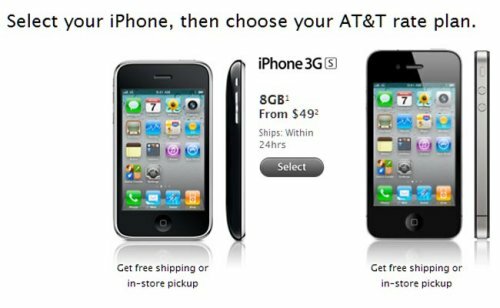 Apple has now dropped the price of the last generation iPhone, the iPhone 3GS to $49 with a new two year mobile contract. This goes along with the recent price drop from AT&T on the iPhone 3GS and comes just as we are expecting Verizon Wireless to announce the Verizon iPhone, so this is AT&T’s chance to lock customers into a new two year contract before Verizon starts selling the iPhone. We aren’t sure if Verizon will be selling a version of the 3GS as well as the iPhone 4, but we suspect that it will just be the iPhone 4 and we won’t see another iPhone available on the network until Apple launches the next iPhone. 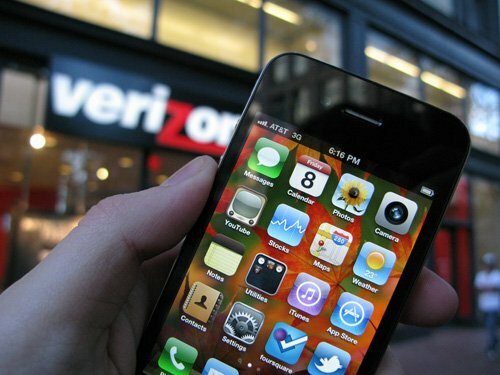 Apple may be planning an end to its restocking fees at retail which would help fuel the Verizon iPhone launch. The company would permanently waive the 10 percent penalty for anyone returning a device in the usual two-week grace period, starting January 11. That’s the same day as the special event. However, 9 to 5 Mac didn’t say if it was a permanent policy or just a one time promo with the Verizon deal, but it wouldn’t be exclusive to the one device. Of course the company has not commented on this as yet. This might help get customers to try an apple product, if they were hesitant before. MiLi Power has something different to show off in Las Vegas this year. The MiLi HD is a pretty simple device and you have to admire it’s minimalist nature. It’s a full featured charging dock, but it also includes an internal speaker, a mini-USB connector and an HDMI output. It will help you stream iTunes downloads from your iDevice of choice right onto your television without an Apple TV. It will be available soon for just $99.99 if it fits your needs. Apple’s iPhone alarm clock experienced a strange glitch with the new year and failed to wake users on New Year’s Day and January 2. This is caused by a bug that Apple still hasn’t fully explained, but the company did make a statement yesterday saying that the failure of its clock app only happens when you set a one-time alarm, and that it will somehow fix itself on January 3. However despite that, the problem still apparently exists. So if you want to make sure that you wake up on time and don’t piss off your boss, here’s how to work around the problem until we get a proper fix. The CDMA iPhone rumors just won’t go away and now there are reports that Apple is optimistic for a great 2011. The company is apparently planning to ship five to six million CDMA iPhones between January and March, and has increased the production of regular iPhones from thirteen million to fifteen million, bringing the total number of possible shipments to twenty-one million. Rumor is that the CDMA version won’t be exclusive to Verizon since it could be shipping to the US and also Asia Pacific, with carriers like China Telecom, KDDI Au, and SK Telecom all possible destinations. Foxconn is said to be producing both editions of the iphone, and Pegatron will be helping on the CDMA side. We’ve seen our share of iPhone and iPad decals. There is even one that makes your phone look as if you took it apart. This latest will please all of the Back To The Future fans. 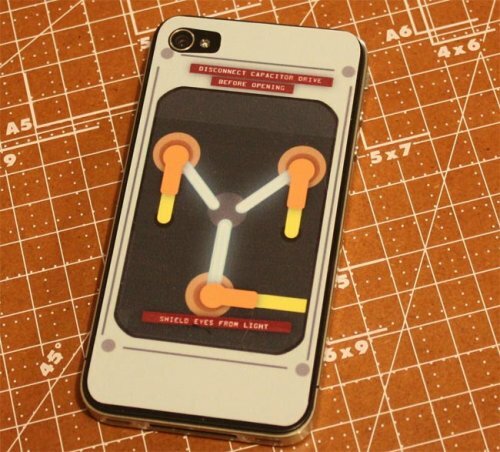 It’s the Flux Capacitor iPhone 4 Decal. That’s right, you can now have the flux capacitor on your iPhone as if Doc Emmit Brown created your phone. If you want one, and who wouldn’t?, this Flux Capacitor iPhone 4 Decal is available for just $6.00 on Etsy. The world’s biggest iPhone is actually a collection of iPads all put together. And it’s pretty impressive. This giant iDevice was built up within London’s St. Pancras International Train Station to celebrate the launch of Lara Croft and the Guardian of Light. The stacks of iPads were all put together, then framed with the black top and bottom of the iPhone, to make it look like a giant iPhone. 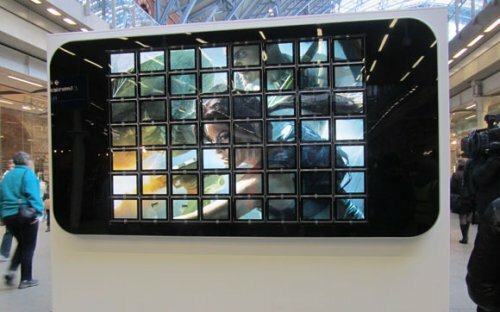 In all, there are 56 of the tablets installed, and they are all running the same looped video over and over again, which shows the mobile version of the latest Lara Croft game. 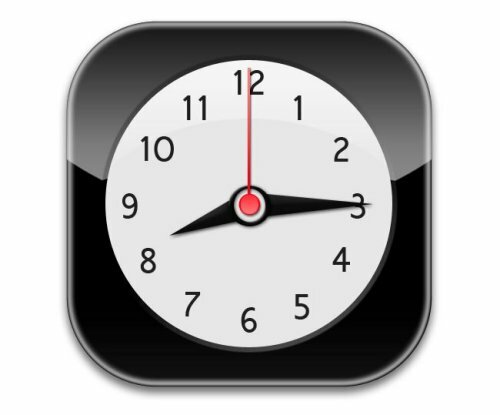 The iPad version is priced at $9.99, while the iPhone and iPod Touch versions are $6.99. The white iPhone 4 may be just a dream, but at least you can still have one on or under your tree this Christmas. That’s because a seller at Etsy has made some white iPhone 4 Christmas tree ornaments. The ornament measures 3″ x 1.5″ and comes ready for hanging on your tree. It also has magnets on the backside so that it can also be used as a fridge magnet after the holidays are over. It’s just $10 and will have to do since you can’t get the real deal. Stuart Hughes is known for their gold, platinum, diamond, and crystal encrusted gadgets. But how do you up the ante on those precious gems? You use a material that dates back to 65 million years. This one was conceived by his wife, Katherine Hughes. It’s the iPhone 4 History Edition, the world’s first Dinosaur mobile phone. 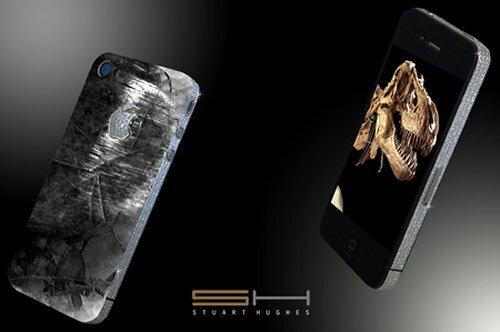 It uses a tooth of a 65 million year old T-REX and meteor stone together to dress up the rear of the iPhone. The rim is caked with 8.5ct ‘IF’ flawless diamonds and a diamond studded Apple logo set in platinum on the tooth and stone rear. The white iPhone 4 has been delayed several times and was even removed from the online Apple Store. There was never any official confirmation from Apple that the device was canceled, but that was the rumor. 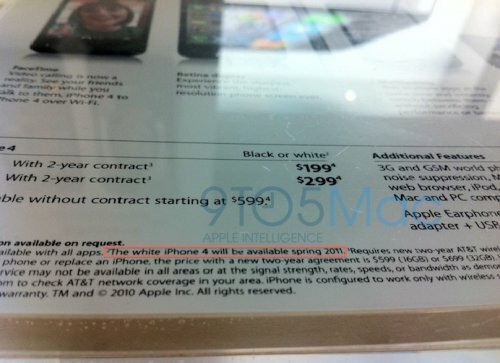 And now the latest in the white iPhone 4 saga is that some new signage has been going up in Apple stores which features a footnote that the white iPhone will be available in spring 2011. Hopefully that is really the case. It’s in line with what Apple previously mentioned. Maybe we can get a happy ending for all of you white iPhone fans yet. The white iPhone 4 still hasn’t been officially released by Apple, but now it seems that some white iPhone’s are making their way out of the back door of Foxconn, as GizChina is reporting that real white iPhone 4s are being sold on the grey market in China. 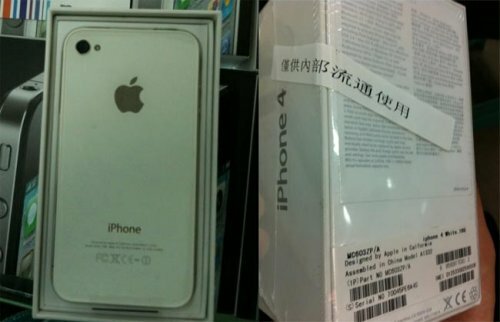 The white iPhone 4s are only supposed to be meant for internal use, and are not to be sold, but now they are turning up for sale in China with prices starting at $828 and going all the way up to $1204. 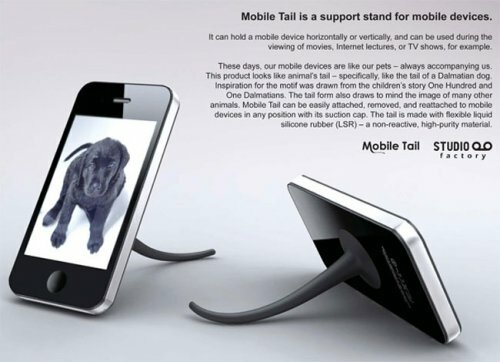 Some people treat their iPhone better than a pet, so why shouldn’t it have a tail? 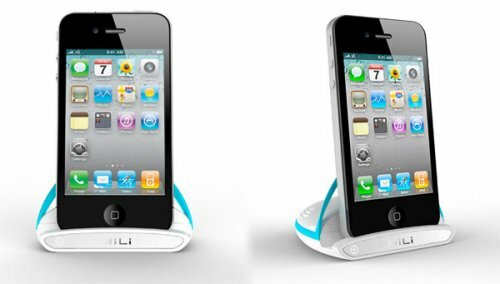 The Mobile Tail is a silicone tail attached to a suction cup that can be attached to the back of the iPhone or any other mobile device. Once stuck to the mobile phone it will hold the device in an upright position so you can watch videos on it. The tail doesn’t wag, otherwise your device would fall flat. It comes in several different colors. At least it would, but it’s just a concept. Still it is cute if you like puppies and the like. 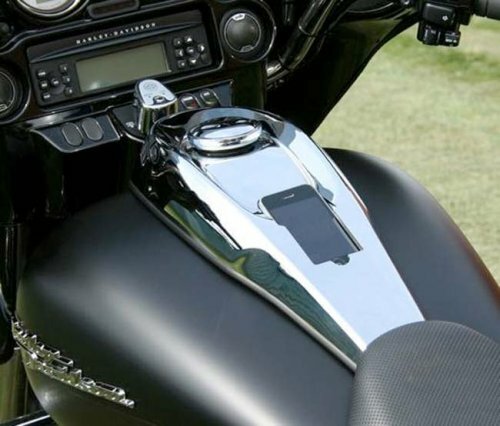 Here’s an iPhone dock that Harley owners will love. The DashLink iPhone and iPod Dock. It’s specially designed for Harley Davidson’s FLHT/FLTR and FLHR model motorcycles, and it has built in charging and a self sensing on and off circuit which detects if your iPhone or iPod is plugged in. More importantly it looks great on your bike. If you own a Harley, and want one for your iPhone or iPod it will cost you about $400 from Hells Foundry. Pretty awesome. 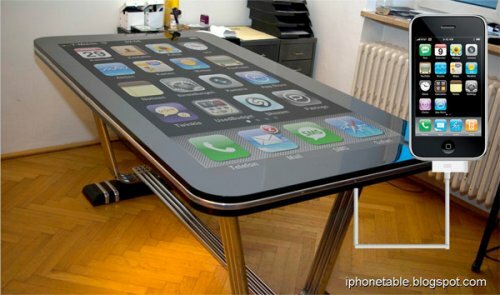 The Table Connect for iPhone is a 58-inch multitouch surface that accepts iPhone 4 connections via a 30-pin Dock Connector and then becomes your iPhone. The team is currently wrapping up an alpha software release, and even though a jailbroken iPhone is necessary, this is pretty impressive. We hope that this will eventually go on sale for the rich and giant iPhone needing folks among us. It may be too late to celebrate dressing up your iPhone for Halloween this year, but that doesn’t mean you can’t be ready for next year. And so Speck has released a collection of Special Spooky Limited Edition iPhone 4 cases. Only 62 of each of these case designs have been made and they are designed by Dirty Donny. There is the Fitted for iPhone 4 Monster Revolt, Rock of Lamb, King Death, and Eyeballz. All very appropriate for Halloween.